Hello, and welcome! We can't wait to share everything you need to know about Begin. Begin is a serverless application platform. More specifically: Begin is a batteries-included system for provisioning and managing of a wide range of next-generation AWS cloud infrastructure. With Begin, you can create entire serverless apps and sites with full databases, sessions, CI, and local development tools all built right in. 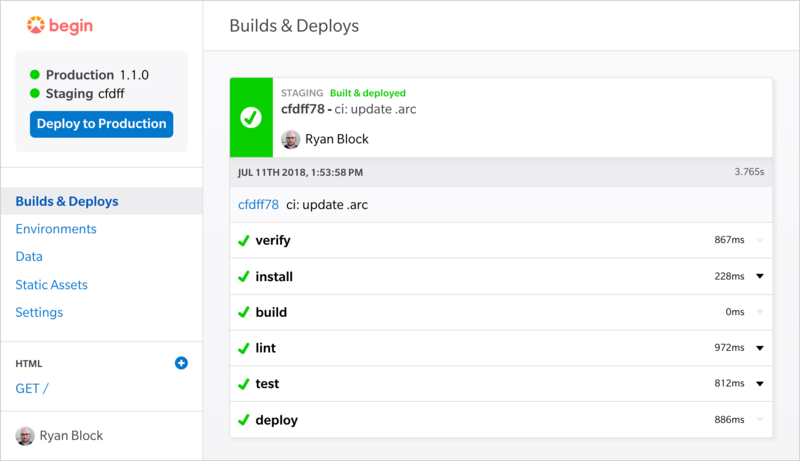 Once connected to your codebase, Begin automatically services your entire CI and deployment pipeline, so you can focus on your product and your customers – not on infra, tooling, or scaling. Begin enables you to take full advantage of AWS's next-gen cloud infra without the hassle and setup. Think: serverless stack on easy mode. What can you build with Begin? What shouldn't you build with Begin? Compiled mobile and desktop apps – if you need CI and build distribution for your compiled mobile or desktop app, we suggest services like BuddyBuild, CircleCI, and TestFlight. But if you need to build your backend and APIs for your mobile app, Begin is here for that! Begin started out as a cloud infrastructure framework built to help tame the immense complexities associated with managing releases to hundreds of Lambdas, API Gateways, and other AWS serverless services. That project became known as Architect, which we (Begin) donated to the JS Foundation in 2017 under an open governance model and Apache 2 license. Apps built with Begin are fully compatible with Architect. You can eject your apps from Begin at any time and run them on your own AWS infra, should you want to – and we're committed to making that easy to do.